Since she was 12 years old I performed in all shows from my school singing and playing the guitar or Paraguayan Harp. Even though she was sure that she love singing the best. She took part in San Andres School Music Contest singing and playing shakers with Hugo Arriola playing the guitar and Nito Lezcano in Bongos (2001). She also took part in American College Music Contest singing and playing the guitar with Federico Farina, who also played the guitar. She got Second Place (2001). She recorded a DEMO “Every breath you take” (cover from THE POLICE), which was played on the radio for several months and was in the Top 20 (2002). Backing vocals and guitar for Quique Calabresse’s acoustic concerts during 2003 and 2004. 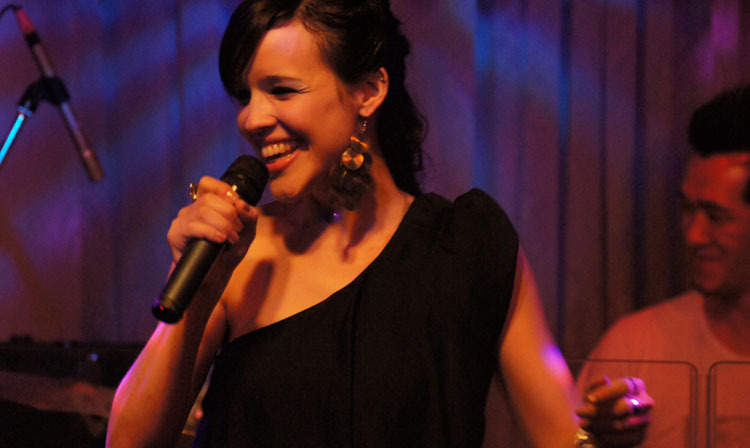 Backing vocals and percussion for Argentinean singer Ariel Leira’s concert (December 2003). Performed at the National Exposition of Arts (2003). Recorded Jingles for radio and TV (2002-2004). I worked singing and playing harp in Tunisia at the ABOUNAWAS Le Palace Hotel together with Tony Martinez (guitar and percussion), Emilio Paredes (guitar and vocals) and Liz Lopez (dancing) from May to August 2003. I was invited to play harp in the “100 years of Guarania Commemoration Festival” at Tamkang University in Danshui organized by the Paraguayan Embassy (2004). She was invited to play de guitar and sing at the Chinese New Year’s Party held by Tai Ji Men (February 2005). Performed at class concerts from the National Taiwan University of Arts. Organized concerts with other singers at the National Taiwan University of Arts and Shi Fang Yue Ji in Taipei. Performed several times singing, playing the guitar and harp together with local and international artists in many cities of Taiwan since 2005. Recorded 3 Guatemalan songs with various artists, for an album that will be soon released.